As you may know, we will be appearing at 7pm Chicago time, on the primary local PBS station, WTTW on the program "Chicago Tonight". In a bid to get some research together before our appearance, I've started looking into some of the statistics behind Darfur, with mixed success. Gathering statistics about Darfur has been a very difficult problem, owing to poor record keeping, lack of civil society, and ongoing insecurity problems. To some extent, this vagueness has made it a bit more difficult to provide a meaningful basis for discussion of the effectiveness of the government of Sudan in their ethnic cleansing campaign in Darfur over the last four years. These numbers are most certainly approximate, and are intended to be illustrative. Thus, in the interests of trying to give a sense of scale to the situation in Darfur, I have put together some rough comparisons of the Chicago metro area and the populations affected by the Darfur conflict. 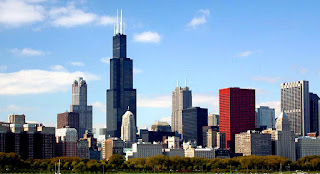 For a baseline, the Chicago urban area (more properly called Chicago-Aurora-Elgin-Joliet-Waukegan, IL-IN area) had a total 2000 census population of 8,307,904, versus an estimated population in Darfur of 7.4 million. To date, the campaigns undertaken by the Sudanese government have accounted for about one in five of the world's "Internally Displaced Persons" - those who have been driven from their homes, most often due to conflict, but have not been able to escape to other countries. Of the roughly 5.5 million people driven from their homes in Sudan, a bit more than half are refugees directly associated with the ethnic cleansing campaign in Darfur. The approximately 3 million people who have had their homes destroyed or have been forced in to relocation camps due to ongoing violence compares with the entire population of Chicago at 2,842,518. The total number of people killed in the genocide thus far has been estimated at 400,000 to 450,000. However, these numbers date back to about April of 2006. As 10,000-15,000 people are killed each month, current totals may range from 480,000 to a worst-case scenario of 570,000. These numbers are roughly comparable to the population of New Orleans (454,863) or Washington DC (550,521). Below the fold is a place-by-place comparison of the population of the Chicago metro area and those who have been directly affected by the actions of the Sudanese government in Darfur. 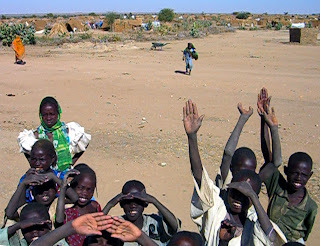 who have fled Darfur, seeking refuge, following the destruction of their homes or other calamities. The population of Chadian ARPs has not been included, as I have not been able to find pertinent statistics. A good map of camp locations in Sudan can be found here. In the interests of space and relevance, locations with less than 3,000 people are not listed. For sake of comparison, U.S. fatalities in Iraq have just reached 3,000, while 2,819 perished in the attacks of 9/11. Locations in Africa are listed in bold. Good to see you made it back in one piece!